The weather in Chicago has been a bit cold the past week. I'm not complaining by any means. We had unseasonably warm weather for a few weeks before that. But this chill in the air has me craving some of my favorite fall comfort foods. This weekend we had a huge tunder + lightning storm. I couldn't pick a better dinner than a big bowl of hearty chili to go along with that storm! This is my new favorite chili recipe. I've tried a few from scratch before and this one has everything I'm looking for. A little tang balanced with some brown sugar, a slight kick of heat - just enough to tickle your lips, and lots of hearty, thick chunks of meat and beans. I know in some parts of the country chili is religion - that's not the case where I grew up. I still think this recipe could hang with the best of them! In a large pot, brown your ground beef with a little olive oil. Once meat is browned, remove it from the pan. Add your onions and cook until translucent. Add in carrot and garlic and cook for another 2 minutes until softened. Add your meat back in the pot an pour your beer (I used PBR but any light beer would do), beans, and diced tomatoes. Give it a quick stir and add all of the remaining ingredients. Once mixture comes to a boil, reduce heat to low and gently simmer for about 4 hours, stirring occasionally. Top with your favorite fixin's and serve! think of chili as a hodge podge of ingredients. i add balsamic vinegar and a little brown sugar to balance the dish but you can leave it out. 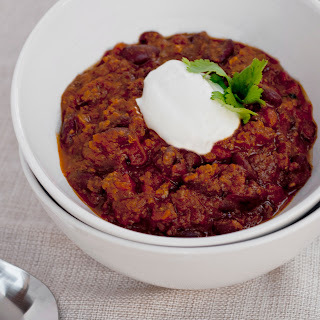 this chili is subtly spicy, if you like more or less kick, play with the cayenne and chili pepper sauce or red pepper flakes. don't have green chile? it's ok, you can leave it out. you could also add in your favorite veggies. think red bell pepper, or carrots, sweet potato or corn. i like the depth of flavor that beer adds to the dish. don't make the same mistake i once did and use a super hoppy IPA. chili is best with either a porter, stout, or american ale. i like PBR but you could use coors light, miller light, or your favorite light beer. if you're going the stout/porter direction, choose one you love. like the idea of beer but don't have any on hand? you can substitute a little instant espresso powder instead of using a porter or stout. don't want to use beer? that's ok too. just use a good beef stock or water. beans or no beans... it all depends on where you're from. for me chili isn't chili without beans. i like kidney beans but you can use whatever ones you have on hand. black beans or pinto beans would be great in this for a little mexican twist! oooh, if you do that, add some corn kernels too, yum! you can also play with the type of meat you use. lighten it up with some ground turkey or chicken breast. try it with a combo of ground pork and chuck, OR don't use ground meat and use chunks of brisket, steak, or even pulled pork. mmmmm, pork. 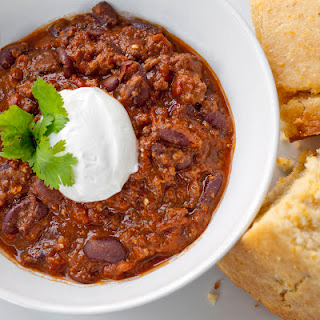 if you like a thinner or thicker chili, you can add more liquid or thicken it up with some cornmeal or cornstarch.